gold in the ice dancing . 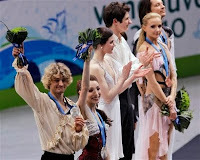 The United States team won Silver and that was equally exciting as the two teams train to-gehter and are good friends. It was so exciting to see them on the podium along with the Russian pair who took the Bronze medal.All performances were exceptional..
We've been enjoying the coverage of the winter Olympics. It's been quite enjoyable. Go Canada! I woke up this morning to hear we won another gold and couldn't be more proud of our young Canadian athletes! Way to go! I'm glad I stayed up late last night to watch. It was exciting. (Maybe it's my imagination, but I thought the Russian couple didn't look too happy). I enjoy the ice skating too. They all look so beautiful and gracful out there skating. I am happy for all of us. When our countries win, it always makes us proud. We have some very good young people entered in the Olympics this year and it is great to see the winners and know how hard they worked to receive those medals. They all need to be congratulated!!! And congratulations to you and Canada!!! Have a wonderful day Maggie. We're very excited here too-the Israeli pair came in 10th-which is pretty good for us! And to think, this couple are our neighbours! Completely awesome indeed!! !